Pancreatic cancer is the fourth leading cause of cancer deaths in the United States but only the tenth site for new cancer cases (estimated at 30,300 in 2002) [1, 2]. The reason for this major difference is that there are no clear early symptoms of pancreatic cancer and no screening procedures or screening policy for this disease. It is usually diagnosed at a late stage and has a poor prognosis with a 1-year survival rate of 20% and a 5-year survival rate of less than 5% . Complete surgical resection is the only way to significantly improve prognosis and possibly lead to a cure. Unfortunately, only 15-20% of the patients can undergo resection with median survival rates from 12 to 19 months and a 5-year survival rate of 15-20%. A large majority of patients with pancreatic cancer receives palliative care or may follow a therapeutic approach the impact of which is currently quite limited and difficult to assess quantitatively . Figure 4.1: Human anatomy indicating the location of the pancreas and major neighboring organs (reprinted from http://pathology2.jhu.edu/pancreas/ pancreasl.cfm). a number of other factors including alcohol consumption, diet and nutrition, occupational exposures, genetic predisposition, multiple endocrine neoplasia, hereditary nonpolyposis colorectal cancer, familial adenomatous polyposis and Gardner syndrome, familial atypical multiple mole melanoma syndrome, von Hippel-Lindau syndrome, and germline mutations in the BRCA2 gene [4-6]. Tumor markers have been used for pancreatic cancer including carcinoembryonic antigen (CEA) and carbohydrate antigen 19-9 (CA19-9) but no conclusive results exist to date . Figure 4.1 shows a drawing of the human anatomy, the location of the pancreas, and major surrounding organs and structures. 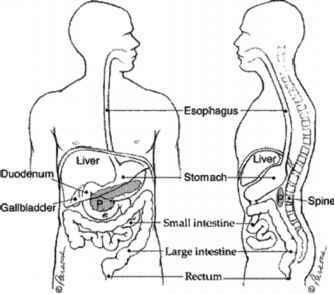 The pancreas lies in the upper abdomen, transversely behind the stomach, with its tip very close to the hilum of the spleen. 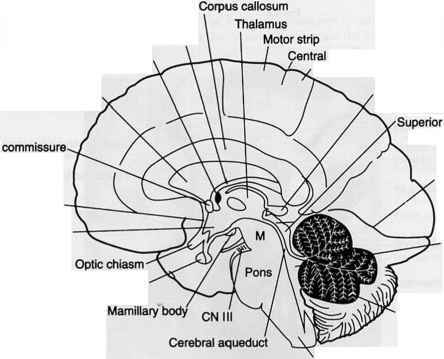 It is an elongated organ with three major parts: head, body, and tail as shown in Fig. 4.2. The pancreas is a gland that produces regulating hormones and enzymes for protein breakdown. The enzymes are secreted into the duodenum through a set of tubes called pancreatic ducts. Figure 4.2: Detailed structure and main parts of the pancreas where H = head, B = body, and T = tail (reprinted from http://pathology2.jhu.edu/pancreas/ pancreas1.cfm). pancreatic cancers occur in the head or neck of the pancreas, about 15% occur in the body of the pancreas, about 5% in the tail, and about 20% are diffused through the gland . Pancreatic cancer metastasizes rapidly even when the primary tumors are less than 2 cm. Metastasis most commonly occurs to regional lymph nodes, then to liver, and less commonly to the lungs. 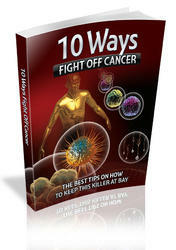 The tumors display a high degree of resistance to conventional chemotherapy and radiation therapy. In each of the areas above, research priorities were defined that could lead to the advancement of our knowledge of the disease and improved health care for the patients. Our interest in this chapter is on the role of imaging and computer techniques on the detection, diagnosis, and surveillance of pancreatic cancer . Hence, this chapter reviews the imaging priorities set by the Review Group , the currently used imaging techniques and state-of-the-art computer methodologies, the requirements for development of computer algorithms for the automatic diagnosis, management, and treatment of the disease, and the challenges posed to the development of computer methodologies. A novel algorithm is also described for the segmentation and classification of pancreatic tumor. Preliminary results are reported from its application on computed tomography (CT) images of the pancreas.